A pile burning operation in the Deschutes National Forest clears undergrowth to lessen the risk of megafire. ASHLAND — This spring’s high school graduating seniors were newborns the last time the U.S. Forest Service proposed a major forest thinning project around here — and the outcome was a disaster. Nicknamed “HazRed,” the controversial fuels-reduction proposal included plans to commercially log large sections of forest, with trees as wide as six feet reportedly marked for removal. In the explosive public backlash, residents bombarded the Forest Service with negative comments, conservation groups filed appeals, a district ranger was fired (then rehired), and years of administrative and legal wrangling undermined the public’s already uneasy trust. The Lomkatsi crew’s work this day is the fruit of a new wave of collaborative agreements on timber in Oregon. Instead of locking horns in expensive court battles that often delay work for years, collaborative groups of environmentalists, timber leaders, agency officials, and local residents negotiate long-term agreements that provide a little something for everyone. In Ashland, the stakes are high for area businesses. In 2013, smoke from nearby fires forced the Ashland Shakespeare Festival to cancel several shows, and the Rouge Valley’s outdoor recreation sector reported losing more than $100,000 per day during the blaze. In economically depressed communities around the state, local leaders are betting on collaboration as a solution to the gridlock. The project in Ashland has emerged as a model for success. Learning from its failed HazRed initiative, the Forest Service worked with community partners and local residents to develop a plan for the Ashland Forest Resiliency Stewardship Project. The 10-year stewardship agreement helps protect a community of 20,000 residents from catastrophic fire by cutting back overgrown forests — work that has also created as many as 150 seasonal jobs and provided timber to local mills. The problem: like most models, the Ashland project is built to scale. Its 7,600-acre footprint represents only a tiny fraction of the 1.4 million acres in the Rogue Basin alone that forest ecologists say are in need of treatments. The work around Ashland is also expensive, about $1,200 per acre, and federal agency budgets for this type of project have been shrinking since the Great Recession. 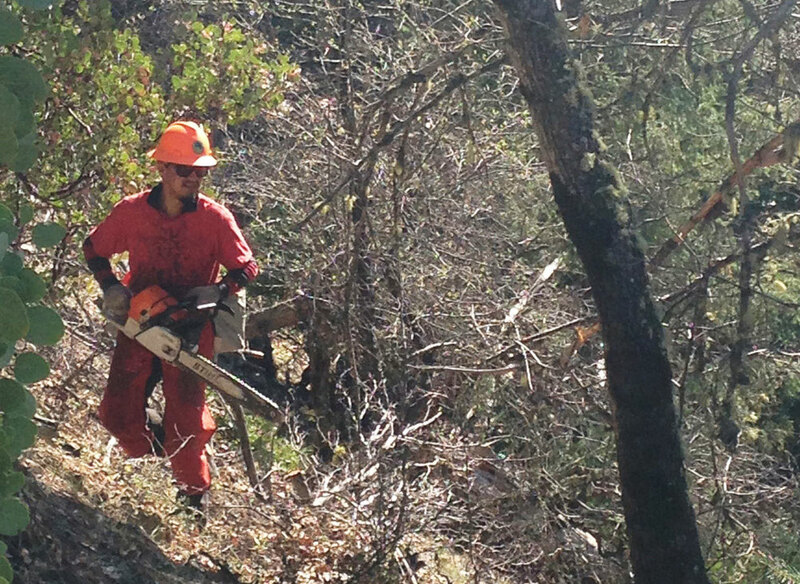 But project collaborators say the costs of inaction in Oregon’s forests are even greater. As fires become increasingly severe, suppression costs will rise and more homes and lives will be lost. Local economies will experience disruptions from lingering smoke, and residents’ health will suffer. And what economists call “ecosystem services” — costs we largely take for granted, like forests’ natural filtration of water — will go up in flames. 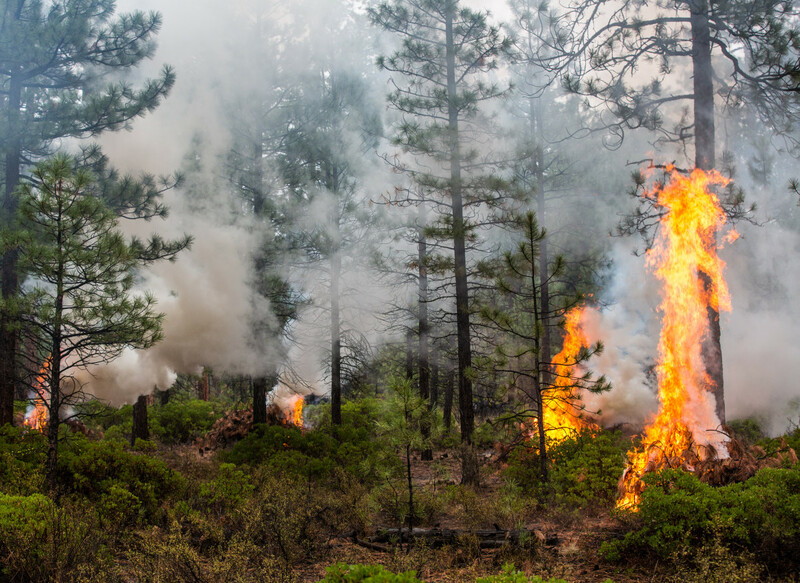 During the Northwest’s record-setting fire season in 2012, southern Oregon’s Barry Point fire took only 22 days to blaze across 145 square miles of private and federal forestland, reducing thousands of Ponderosa pine trees to blackened skeletons. This wasn’t your grandfather’s forest fire, either. Unlike the low-severity burns that used to arrive every 10 to 20 years in these forests, the Barry Point fire burned extremely hot, resulting in tree mortality rates above 75 percent on nearly half its footprint. The Barry Point fire highlights the mounting costs of gridlock on public lands and helps explain exactly how environmentalists and the timber industry — once bitter adversaries — became allies on forest restoration. In Oregon, that story begins in the 1990s after efforts to protect the endangered spotted owl forced major reductions in logging on federal land. Facing a shortage of logs, rural Oregon’s struggling mill towns wanted desperately to keep their processing plants supplied with affordable timber. Meanwhile, progressive conservationists were beginning to question the wisdom of a hands-off approach to forest management. The problem, science showed, is that nature’s forests aren’t all that natural anymore. Native “legacy” trees have been crowded out by smaller intruders that fire once cleared out, depriving the old growth of nutrients. For Oregon’s dry-area forests, science pointed to a solution: reducing tree density to eventually help fire return safely. While this often entails tedious thinning of plants and small trees that cannot be sold, the restoration prescription also sometimes calls for selective removal of medium-sized trees, which then can be sold to local mills. Leaders in both the environmental and timber communities appear to buying in. According to a list compiled by the University of Oregon’s Ecosystem Workforce Program, there was just one forest collaborative group operating in Oregon 20 years ago. Today, there are at least 25. But if the coming together of timber and conservation interests seems inevitable, it’s not — a point underscored by the ongoing legal challenges across the state. Last year, lawsuits and public pressure forced the state to cancel 26 timber sales in the Elliott State Forest, the latest in a string of courtroom victories for environmental groups attempting to halt logging on public lands. Meanwhile, the timber industry is pursuing a legal remedy of its own — the Swanson v. Salazar case — which aims to compel the Bureau of Land Management to increase timber harvests in southern Oregon. For timber companies, restoration projects don’t have the same payoff as traditional timber sales, which generally allow harvesting of larger, more valuable trees. The advantage of collaborative restoration agreements is that they’re supposedly less likely to be shot down in court — but Partin says that hasn’t always panned out. For example, after the Clackamas Stewardship Partners reached an agreement in 2012 for a 2,000-acre thinning project near Mt. Hood, the environmental group “Bark” still sued the Forest Service in an effort to halt logging. Partin says these lawsuits undermine the purpose of the collaborative process. Even the Ashland project — widely considered a model for ecology-driven restoration — hasn’t managed to avoid legal challenges. Despite years of collaborative planning between the Forest Service and community partners, the push for consensus hit a snag over just how much logging should be allowed — and where. Local activist and scientist Jay Lininger disagreed with proposals to thin trees in the roadless backcountry and on steep slopes, where he argued that logging could cause soil erosion and increase the risk of landslides. He also attacked what he called a lack of transparency about exactly what was being logged. In 2010 he and former Ashland city councilman Eric Navickas filed a lawsuit challenging the collaborative plan approved by the Forest Service, initiating a series of hearings and appeals that are still unresolved. Lininger has said he supports the vast majority of the work in question — and the narrow scope of his legal challenge never threatened to kill the project entirely. But the speed bump did reveal just how fragile collaborative agreements can be. Shortly after the lawsuit was filed, the Forest Service revoked $2 million of the project’s original $6 million grant award, citing concerns that the project might not be completed on time. Only after public pressure from Oregon Senators Ron Wyden and Jeff Merkley was the funding restored. Yet despite these setbacks, the Ashland effort and collaborative projects around the state appear to be gaining momentum. In 2013, the Forest Service and eastern Oregon’s Blue Mountain Forest Partners worked out a 10-year stewardship agreement to thin trees in the Malheur National Forest, promising an annual timber yield of more than 50 million board feet. The deal helped rescue the town of John Day, a small eastern Oregon timber community where the last surviving sawmill was on the brink of shutting down. Collaborators in Ashland received similar good news this spring, when the Ashland project was awarded grants totaling $3.2 million to continue its restoration work. The boost came amid indications that community support for the project is at an all-time high. According to a study by Southern Oregon University professor Mark Shibley, 74 percent of residents surveyed in 2013 agreed that commercial thinning and density management in Ashland is a “legitimate tool that resource managers should use more often” — up from 53 percent just a year earlier. Even when collaboration yields agreements with widespread support, projects face another major challenge: finding the funding to get started. Since 2009, Forest Service spending on fuels treatments in Oregon has dipped 41 percent, from $21.9 million to $12.9 million annually. The budget shortfalls have been even more severe at the Bureau of Land Management, where the Medford District’s fuels-reduction budget fell from $11.8 million in 2003 to just $3.1 million a year ago. The cuts have hit hard for local contractors. Michael Wheelock, president of Josephine County-based Grayback Forestry, says his company has lost half of its thinning and restoration workload in southern Oregon, resulting in layoffs for some 40 employees. Other workers have been forced to travel to projects hundreds of miles away, while their hometown forests — among the most overgrown in the state, according to a study by the Forest Service and The Nature Conservancy — slip further into disrepair. With federal dollars in short supply, one solution is to develop projects that bring in enough revenue to cover treatment costs. In 2014, a report by the Southern Oregon Forest Restoration Collaborative identified 54,000 acres in the Illinois Valley alone that would be eligible for treatments — and unlike the Ashland stewardship project, these forest parcels were screened for economic viability. The high density of merchantable timber there and proximity to existing roads would allow agencies to recoup most of the direct treatment costs, while still enhancing forest health, said George McKinley, executive director of the forest collaborative. The study has the support of a diverse coalition of partners, including The Nature Conservancy and Rough & Ready Lumber Co., and work is underway to expand analysis across the entire Rogue Basin. Phillippi, Rough & Ready’s president, says restoration alone won’t replace the need for timber sales on public lands, but it could go along way to ensuring rural mills like Rough & Ready keep their workers on the job. When cancer comes calling, what if owners of small forest plots had another choice but to sell or to cut? That’s the premise of a pilot program being launched in Washington and Columbia counties of northwest Oregon.